Inspired by John Key’s comment “Wellington is dying” (ugh), between March and May 2014, the Stout Research Centre is holding the ‘Wellington Seminar Series’. The seminar features presentations from local and central government representatives, as well as anthropology, psychology, film, theatre and management researchers from Victoria University. New Zealand Studies expert Professor Richard Hill from the Stout Research Centre says the idea for the series came about as a way of countering perceptions that Wellington is a dying city. 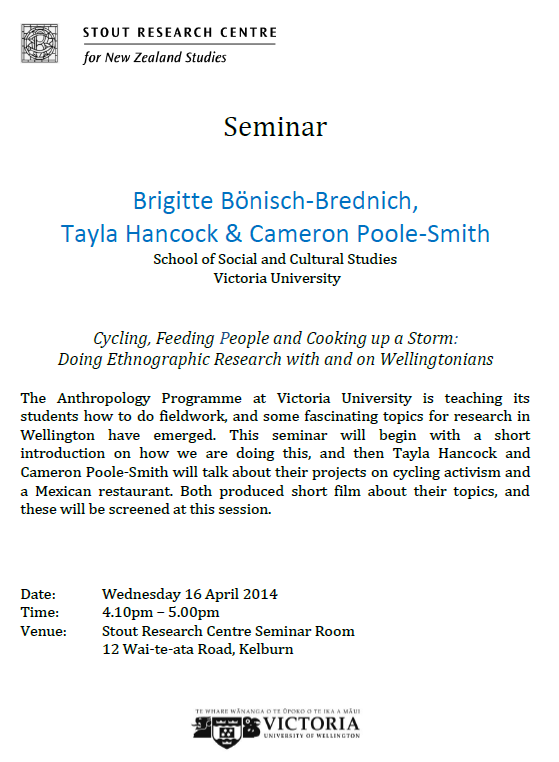 As part of the Wellington Seminar Series, next Wednesday the 16th of April at 4.10, Professor Brigitte Bönisch-Brednich (one of my MA supervisors) will talk about how the Anthropology Programme at Victoria University is teaching its students how to do fieldwork, and some of the topics that have emerged from research in Wellington. I, along with Cameron Poole-Smith who did his honours in Cultural Anthropology with me last year, will then talk about our projects that we completed as part of an honours paper which had us undergo our own ethnographic fieldwork. Cameron’s research looked at cycling culture in Wellington. I focused my research on the wonderful Mexican Restaurant Viva Mexico, situated in both Left Bank Mall and on Riddiford Street in Newtown. 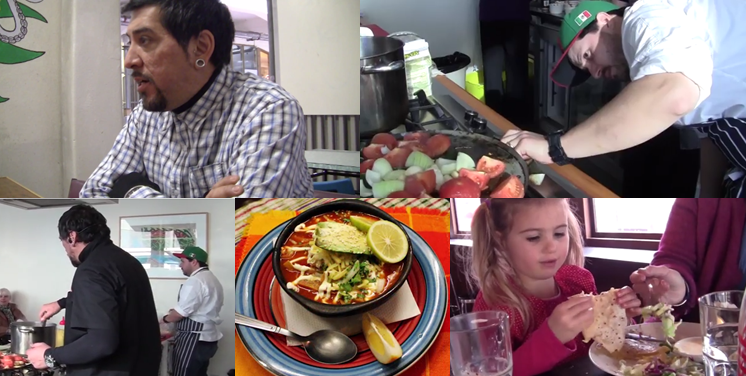 The aim of my research was to find out how restaurant owners Antonio Gonzalez and David de orta Jimenez maintained their Mexican identity while living in Wellington, New Zealand. As a result of my research, I produced a 23min film which discussed themes such as food as a medium for cultural identity and cultural appropriation. If you are around the Wellington area next Wednesday, please come by and show your support for us! I’m really excited to be given the opportunity to talk about my film some more as it was a project that I was so passionate about, and I am so happy that it continues to have an impact even after the assignment was submitted. I will post the film on the blog in the next week or so with a little bit more detail on how I went about the research, my methods and so forth. So stay tuned! That tortilla soups is perfection . This kind of seminar is really necessary for those who never know the value of food and waste it just because they are wealthy and never respect of food.